The Power Periscope Feed Head™ takes the best of the Manual Periscope Feed Head™ and adds a high torque 12-vdc motor with a chain and sprocket drive assembly fitted within a protective safety shield. Power for this drive assembly is supplied from the AeroSpreader™ feed broadcaster’s onboard battery as part of the Honda® blower motor’s electric start and charging system. 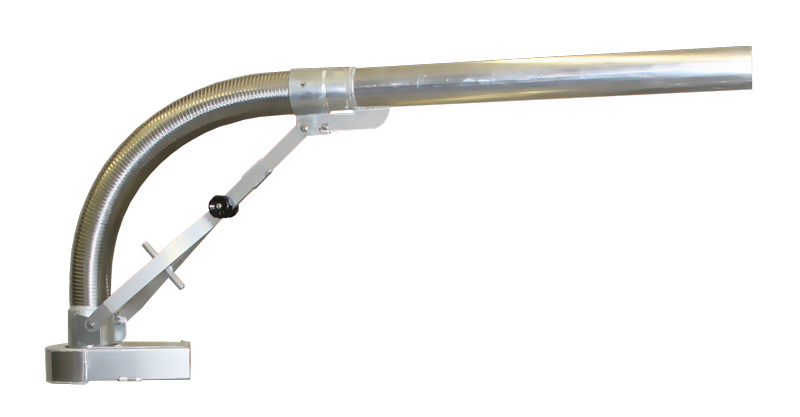 The Power Periscope Feed Head™ option is an ideal addition for farm operators who wish to operate their AeroSpreader™ Dry Pellet Feed Broadcaster from a truck, trailer or ATV. In these feeder applications when matched with the optional remote cable controls for blower speed and feed gate controls, a driver controlled power switch placed on the same console assembly allows the Periscope Feed Head™ to be rotated and aimed for best feed pellet drop without leaving the driver seat. Especially useful when the Feed Extension Tube has been added for additional feed broadcast distance and where the farm site has any number site obstructions to be cleared or when wind and feed delivery sight lines change for the driver. Full control of the Periscope Feed Head™ gives the driver/operator the option to aim the feed broadcast outlet anywhere over the Periscope Feed Head™ 360-degrees of rotation. This power drive option improves the driver’s ability to control the feed broadcast nozzle position while speeding up site feeding and feed hopper reload turn-around times by offering a quick means of driver control of the feed broadcast outlet nozzle, to tuck the outlet inboard of the truck for driving to and from your centralized feed storage facility and then to quickly aim and resume the feeding process when back on site.